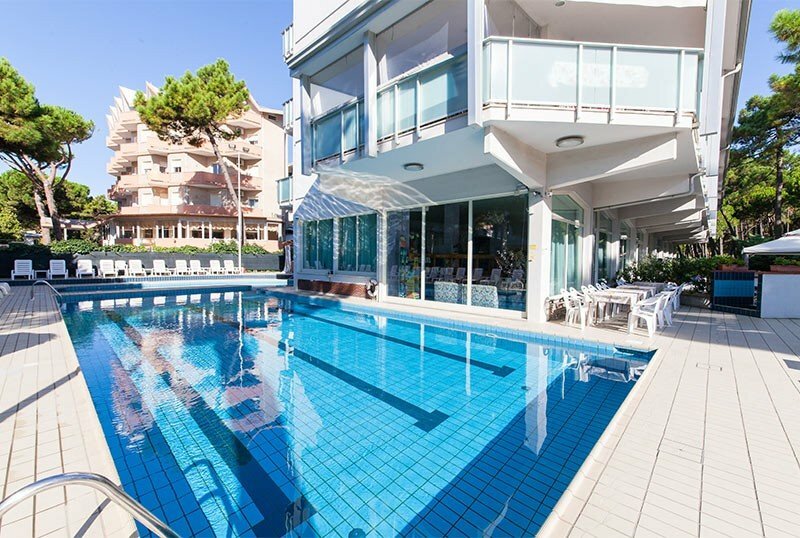 Hotel Sahara is a 3-star superior hotel in Milano Marittima, with a large garden, two swimming pools and a Jacuzzi. It is close to the beach and has parking, free WI-FI, services for children. Accept small pets with supplement. The hotel is located in Milano Marittima in the green area of the Anello del Pino, less than 5 minutes walk from the beach. The rooms have air conditioning, ceiling fan, balcony, satellite TV LCD, WI-FI, safe, telephone, private bathroom with shower and hairdryer. For an extra charge: breakfast in the room and minibar. FAMILIES: suites composed of 2 connecting rooms are available. Two temperate pools with Jacuzzi, garden, open-air porch, sun terrace, TV room, reading room, bar, lobby, elevator, theme nights. For an extra charge: beach towel and laundry service. PARKING: uncovered and free with 25 seats. PETS: small pets allowed with a supplement of € 15 for room sanitation. LUNCH AND DINNER: the kitchen offers traditional dishes and international recipes. Every day you can choose between the dishes of 4 different meat and fish menus, always accompanied by a vegetable buffet. Pasta and desserts are homemade. Every week a Romagna-themed evening. In the hotel: children's pool, outdoor playground area, babysitting service for a fee. At meals: baby food , kitchen for parents, bottle warmers, high chairs. The hotel's garden features a swimming pool for adults and one for children, both heated, a hot tub and a sunbathing area equipped with sun loungers and parasols. An infrared sauna is also available. 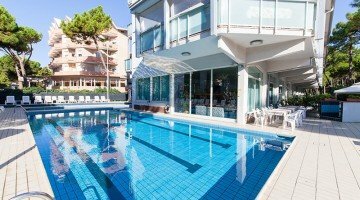 The hotel has an agreement with Bagno Targhini n. 308 (with playground area for children, beach tennis and beach volley courts, sup / surf / windsurf lessons) and Bagno Katia n. 307 (with gym, nursery, restaurant, pedal boat rental, live entertainment). TOURIST TAX: not included. € 1.50 per person per day in June, July, August. € 1.00 per person per day in April, May, September. Valid for people over 14 and up to 7 consecutive nights. Invalid bid during the period from 10 to 17 August. - 7 days full board holiday pay 6!